These small adapters will allow you to turn your IP cameras that are not PoE in to PoE IP cameras so you can send data/power over a single network cable. 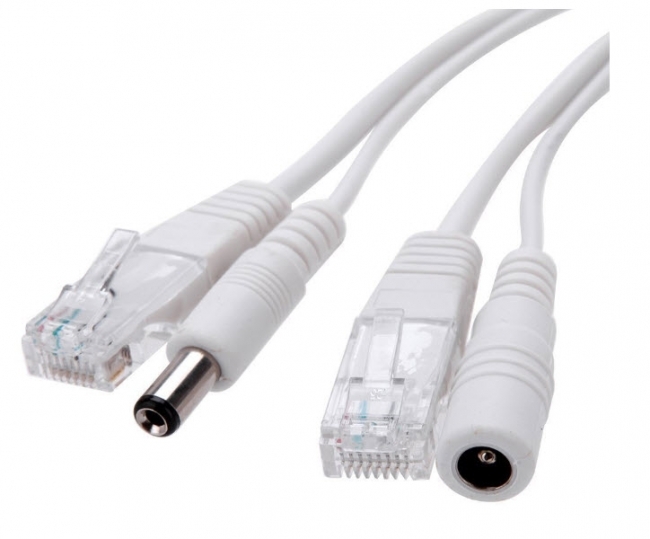 Simply connect the adapters to each end of the cable, and to your IP security camera. On the power end, connect a 12V power adapter to the female power jack, and the network connector to your router or switch. We recommend you don't use a PoE switch with this setup. Sorry this pigtail will not work with foscam cameras. I have a couple of non PoE wireless cameras that are only 1 foot apart but looking different direction. 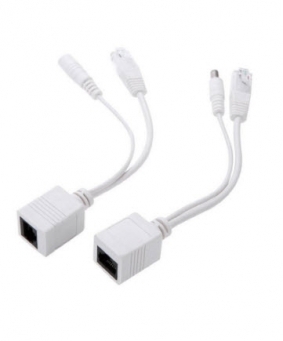 Can I combine these with a simple network switch at the camera location and be able to run just 1 network cable? I do have 120VAC at the camera location. Anything will help as these are 30 feet up in a pine tree and the wireless is not dependable. This item is to run 12V DC power and data to the cameras using a pair of these connectors and a 12V DC security camera power supply. They are not meant for use with a PoE switch. If you would like to deploy two non-PoE network cameras with a PoE switch on one network, you would need this PoE Power Splitter.